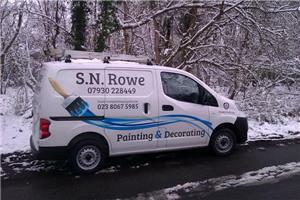 SN Rowe - Painter/Decorator based in Totton, Hampshire. Invoice history based on 106 reviews. S.N Rowe Quality Painting and Decorating is a friendly, reliable, and trustworthy business. I specialise in all aspects of painting and decorating. From following my Father into the decorating trade, I aim to provide my customers with a first class service at all times. My work is always to the highest quality as I have high standards of myself and my work. I have gained a lot of experience over the years and learnt the 'old school' way that the art of decoration is in the preparation and if a job is worth doing it is worth doing properly. I offer highly competitive prices and treat customers homes with the respect I would expect a trades person to show in my own home. I aim to give 100% customer satisfaction and will only ask for payment when the job is complete and the customer is completely satisfied with the work I have carried out. I offer free quotations and advice to all of my customers, I look forward to hearing from you.